Maine’s candidates for governor will debate in Bangor. What do you want to ask them? 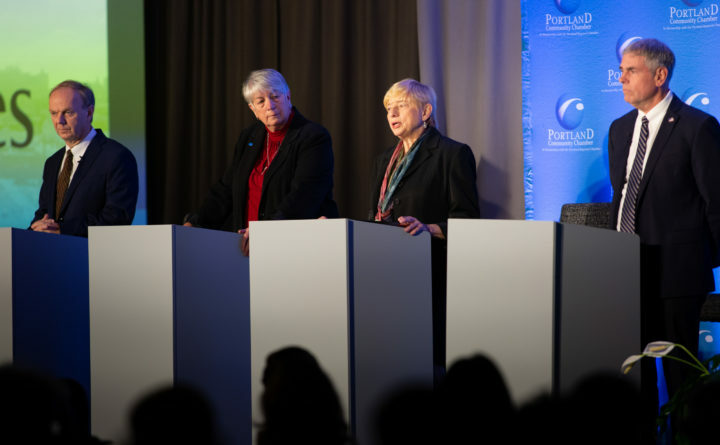 Maine's four gubernatorial candidates stand on stage at a Portland Chamber Of Commerce breakfast forum Wednesday morning at the Holiday Inn by the Bay. From left are, independents Alan Caron, a consultant, State Treasurer Terry Hayes, Democrat Janet Mills and Republican Shawn Moody. The Bangor Daily News, Bangor ABC and Fox affiliate WVII, the Bangor Region Chamber of Commerce and AARP Maine will host the second televised debate of the 2018 gubernatorial race on Oct. 23 in Bangor. All four candidates — Republican Shawn Moody, Democrat Janet Mills, and independents Terry Hayes and Alan Caron — are confirmed for the debate, which will be held in the ballroom of the Cross Insurance Center from 8 p.m. to 9 p.m. There will be a studio audience and admission is free, though an RSVP is required. It can be made through AARP Maine’s website. The debate will air live on WVII and be live-streamed online by the sponsoring organizations. It will be moderated by BDN political reporter Michael Shepherd and WVII anchor JR Mitchell. Readers can submit suggested questions by email at debates@bangordailynews.com. Moody, a businessman, and Mills, the state attorney general, were statistically tied in the only public poll of the race to replace the term-limited Gov. Paul LePage, though that was in August. But if independents gain momentum, it typically comes late in races and Hayes, the state treasurer, and Caron, a consultant, have hoped to use debates to gain it in their bids. The debate will come six days after the first televised debate in the governor’s race. The BDN and Portland CBS affiliate WGME will also co-host the final televised debate of the governor’s race on Nov. 1 — just five days before the Nov. 6 election.